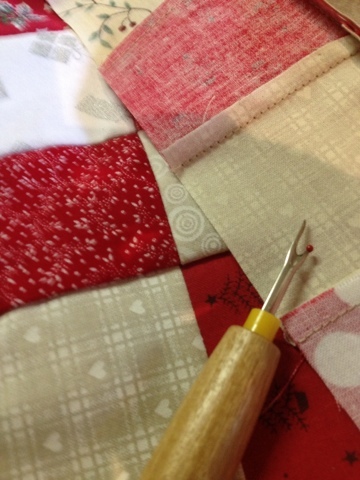 I'm having fun with some Christmas stitching.....and un-stitching today!!! Not long to go before a little stitching therapy takes place. Hope to get some stitching done tonight,hope you didn't have to much to unpick :) Barb. I only learnt the term 'reverse sewing' at my first ever retreat last May - and how to do it efficiently from a Leah Day post after that lol well better late than never, I'm well practised with the doing of it though;-) Never really been into hand sewing / stitching but I am intrigued by everyone's lovely pics in blogland - looks so portable like for when waiting for your kids to finish swimming etc.- and probably easier to reverse sew than fmq! Love the colors in what you're making!